Musicians at Play, Music Fund Los Angeles, and Varèse Sarabande are honored to present Lalo Schifrin’s 85th Birthday Concert at the historic Alex Theatre in Glendale. The evening will be hosted by Robert Townson. Guest Conductor Chris Walden will lead an all-star big band in celebrating Lalo’s life, artistry, and esteemed body of work. 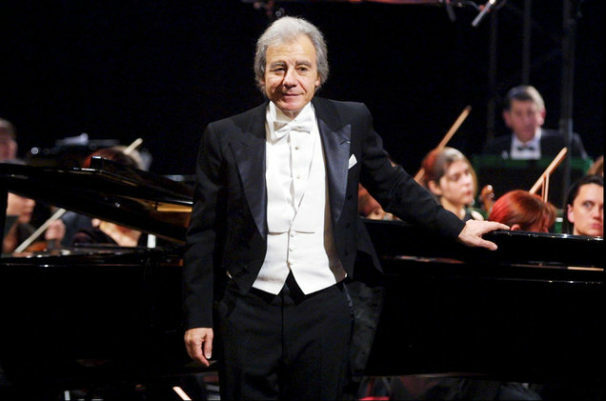 Lalo Schifrin is a venerated composer, conductor, pianist, and jazz musician. He has written classic television themes and over 100 film scores including Mission: Impossible, Mannix, Bullitt, Cool Hand Luke, The Cincinnati Kid, The Competition and so many more. His five Grammys and six Academy Award nominations are a testament to his impact on the music industry. Great to learn this, Marcia. I am going to alert the Schifrin organizers of these dance-related facts. Debra L.
Schifrin wrote the music for Alvin Ailey’s Gillespiana (1961). Also Talley Beatty’s Come and Get the Beauty of it Hot. Latin-flavored. The Aileys eventually boiled that down to Toccata, bits of which are on the Internet, but I don’t know if there’s a complete recording of either choreography anywhere.